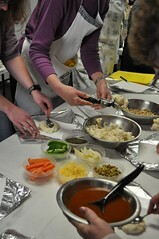 The on-again, off-again, on-again tamale workshop was a huge hit! About 20 people packed into the back of Pilar’s Cafe while owner Sylvia Nolasco-Rivers and her mom walked us through making tamales from scratch. The biggest surprise to me was that it is the masa (corn flour dough) that is the real focus of a good tamale – not the filling. I knew Sylvia and her crew make over a dozen flavors of tamales – from chicken and pork to black bean and even “Greek” tamales with fresh local greens, feta cheese, and kalamata olives – but I didn’t know that they make a different masa to go with the different types of fillings. Chicken tamales have masa made with chicken stock, pork tamales get pork stock, etc. The black bean tamales are even made with black bean “stock” – the saucy broth left after cooking the black beans for the casamiento (beans and rice). All the stocks are homemade from real ingredients – no bouillon here! 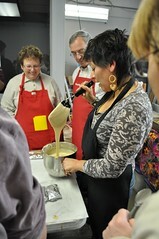 Sylvia makes a very “loose” masa. It looks like cake batter when you first mix it up, and it has to stand for at least one night in the fridge before you can scoop it and roll it into tamales. If you’ve ever bitten into a tamale and found it to be too dry, it’s because the masa was not mixed with enough stock and is simply dry and stiff. After standing for several hours, the masa should take on the consistency of creamy mashed potatoes. Masa will keep a long time in the fridge – a couple weeks at home, though Sylvia uses hers in under a week at the store. Assembling the tamales is a little messy, but not too hard. 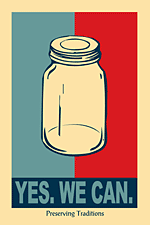 You need a 12×10″ square of aluminum foil and a 6×9″ sheet of parchment paper. You can also use a cleaned square of banana leaf on top of the foil, if you like, though washing the leaves takes several changes of water and is very labor-intensive. Sylvia has stopped using them in her tamales because she’s concerned about the pesticides sprayed on the leaves. Many of her ingredients are organic, or at least hormone- and antibiotic-free, so she doesn’t want to ruin the health benefits by wrapping them in chemical-soaked leaves. Don’t overfill the tamales; an egg-sized ball of masa, spread out with a dimple in the middle, is about right. Add some salsa and whatever fillings you like, then roll it up. This video shows the tamale-rolling process far better than I could explain. After we made our tamales, we sampled some that had been cooked already, along with cortido (pickled cabbage salad) and horchata (an amazing sweet beverage with cinnamon and morro spices, reminiscent of chai but totally dairy-free). Snack time also gave us time to talk – we learned how horchata is made (and wow, is it totally worth $4/cup!) and about Sylvia’s plans to add an espresso bar to the cafe, with horchata lattes and spicy mochas. Yum! Sign me up. Sylvia will probably be teaching more classes in the near future. She’ll announce them in her newsletter (sign up by calling the store at 734-929-4161) and when I learn of them, I’ll alert you to them here, too. Tamale workshop is back on! Sunday, Jan. 10th, 2pm, at Pilar’s Cafe, 2261 W. Liberty, Ann Arbor (map). RSVP at http://tamales.sign-up-sheet.com/ by noon on Saturday! The tamale-making workshop has been postponed. I was out on family business for essentially all of December and couldn’t nail down details before our presenter left for the holidays. I’ll try to reschedule, but I’m not sure when that might happen. Welcome to 2010, everyone! I’m drawing up the schedule for the Ann Arbor group’s year of workshops, and would like your input. Would you take five minutes to answer our survey about topics for this year? Thanks!